I see so many things coming through email and in my mailbox about Mother’s Day. Some want you to buy anything and everything that they can get you to buy. From jewelry to flowers to everything inbetween. A few times, I’ve looked at the ads and went “really – for Mother’s Day”. As a kid, I didn’t spend a lot of money on my mom. If I could find some flowers around the neighborhood, I’d often ask permission from the owner and pick them to give them to my mom. Of course, one time I brought home apple tree blossoms thinking they were regular flowers. My mom loved them anyway. If I could find some chore around the house to do to make the day a little easier on my mom, I would do that. Anything to let her know I appreciated what she did for us and how much she did. Normally though I tried to always help my mom out every day. Most of all, I’d write a poem and make a nice little card for her. I don’t remember buying many cards as a kid because I always made them. I find homemade cards to be much better and more from the heart. Regardless of what you do, you don’t have to spend a lot of money. 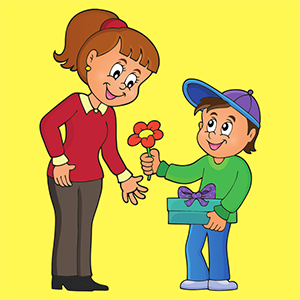 Spending the time with your mom and creatively finding ways to show you appreciate her means more. Just letting her know that you love and appreciate her is by far one of the best gifts you can give her.